Wien, Tom. "Coureurs des bois". The Canadian Encyclopedia, 10 September 2018, Historica Canada. https://www.thecanadianencyclopedia.ca/en/article/coureurs-de-bois. Accessed 18 April 2019. 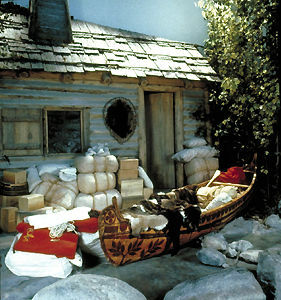 Canoe and supplies (courtesy CMC). Coureurs des bois were itinerant, unlicensed fur traders of New France known as "wood-runners" to the English on Hudson Bay and "bush-lopers" to the Anglo-Dutch of Albany (NY). 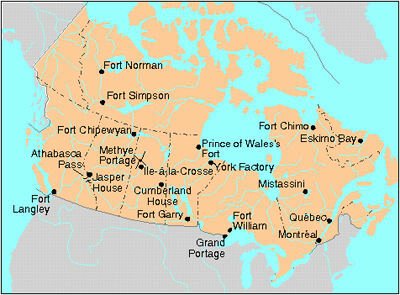 Few French colonists had ventured west of the Ottawa River until the mid-1660s, when a sudden drop in the price of beaver, the arrival of some 3,000 indentured servants and soldiers, and peace with the Iroquois made the change both necessary and feasible. By 1680, despite repeated prohibitions from both the church and colonial authorities, some 500 coureurs des bois were in the Lake Superior country attempting to outdistance the Aboriginal middlemen. 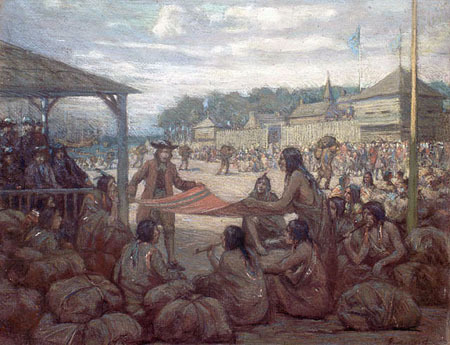 As a result, fewer Aboriginals brought furs to trade at Montréal and Trois-Rivières, inducing colonial merchants to hire some coureurs des bois in order to remain in business. Licensing was eventually introduced by the authorities to control the seasonal exodus into the hinterland. Thus professional, "respectable" voyageurs, usually associated with particular interior posts, came into being. Renegade traders persisted, becoming the primary bearers of the designation "coureur des bois" after the emergence of New Orleans as an alternative focus of the trade in the 18th century. The independent coureurs des bois played an important role in the European exploration of the continent and in establishing trading contacts with Indigenous peoples. Louise Dechêne, Habitants and Merchants in Seventeenth-Century Montreal (1992 ). Allan Greer, The People of New France (1997). Gilles Havard and Cécile Vidal, Histoire de l’Amérique française (2008). Carolyn Podruchny, Making the Voyageur World: Travelers and Traders in the North American Fur Trade (2006). In Pursuit of Adventure: The Fur Trade in Canada and the North West CompanyAn illustrated chronology of attempts to regulate the chaotic fur trade business in New France and beyond during the 17th century. A McGill University website. The Fur Trade at Lachine National Historic SiteFind out the difference between coureurs des bois and voyageurs as well as other basic facts about the fur trade in Canada. From the Parks Canada Lachine National Historic Site website. Pierre BisaillonA biography of enterprising 18th century coureur de bois Pierre Bisaillon. From the Dictionary of Canadian Biography Online. Fur Trade ReadingAbout the Métis who worked as coureurs de bois (runners of the wood), key participants in North America’s far-flung fur trade network up to the 19th century. From the website for the Prince of Wales Northern Heritage Centre. Daniel Greysolon DulhutA biography of coureur de bois Daniel Greysolon Dulhut. Includes interesting accounts of the multifaceted dealings between various Aboriginal tribes and the coureur de bois and other representatives of French settlements in the New World. From the Dictionary of Canadian Biography Online. Lieu historique national du Commerce-de-la-Fourrure-à-LachineInformation sur le commerce de la fourrure au Canada. Par le site Web du Lieu historique national du Commerce-de-la-Fourrure-à-Lachine (Parcs Canada). Adventurers in the New World: The Saga of the Coureurs des BoisA review of a book that chronicles the adventurous lives of the coureurs des bois from the Indigenous Studies Portal (University of Saskatchewan). Pierre BisaillonUne biographie de coureur des bois Pierre Bisaillon. Par le Dictionnaire biographique du Canada en ligne. Running through the woods: The coureurs des boisFascinating details about the hazardous but potentially profitable lives of coureurs des bois and voyageurs. From the Maison Saint-Gabriel Museum and Historic Site. Daniel Greysolon DulhutUne biographie de Daniel Greysolon Dulhut, tour à tour écuyer, enseigne, gendarme de la Maison du Roi, coureur des bois, explorateur, fondateur de postes dans l’Ouest, et capitaine dans les troupes de la marine. Par le Dictionnaire biographique du Canada en ligne. La course des bois: les coureurs des boisDes détails fascinants sur les coureurs des bois et les voyageurs. Par le site Web de la Maison Saint-Gabriel.